Product #60641 | SKU WLC-T04-HWC | 0.0 (no ratings yet) Thanks for your rating! The Nucleus-Nano is a revolutionary wireless lens control system specifically designed for handheld gimbal systems. It makes it possible for a single operator to control a lens gear while simultaneously operating their gimbal. The Nano system is compatible with all DSLR, mirrorless, and modified “cine-style” vintage photo lenses. 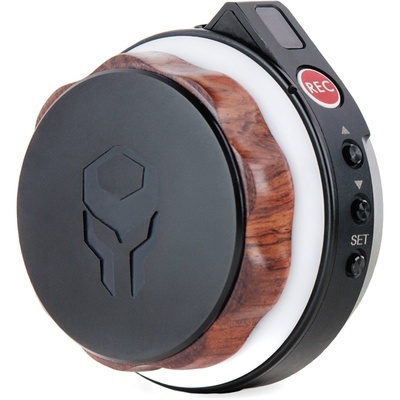 The Tilta Nucleus-Nano Wireless Focus Hand Wheel Controller has a compact knob design similar to professional follow focus hand units (the design is very similar to the Tilta Nucleus-M hand unit’s focus wheel). The Nano Hand Wheel Controller has no delay. It is highly responsive, wireless, and accurate. It is powered via a single 14500 rechargeable battery (which is included in the kit) and yields a 6 hour operating time. When used in conjunction with the Tiltamax Gravity G2X Compact Handheld Gimbal, simple single-handed operation is possible by mounting the controller unit to the gimbal body’s rosette connection. Easily toggle between the G2X’s modes and pull focus at the same time! Simply set the Nano Motor and Nano Hand Wheel Controller to the same channel and you will have full control. The wireless range of both the Nano Hand Wheel Controller and Nano Motor is 300 feet! The Nano Motor allows for automatic calibration of the lens as well as a manual calibration if you are using lenses that don’t have hard end stops at close focus and infinity via the ability to set A-B limits on the Nano Hand Wheel Controller. Lastly, the Nano system can provide record Run/Stop functionality for numerous camera systems. Note: The R/S cables we offer for our wooden handles ARE NOT compatible with the Nucleus-Nano since the engineering and pin configurations are completely different. Using the wooden handle R/S cables are not safe to use with the Nucleus-M or Nucleus-Nano. Only use cables that have been developed by us exclusively for the Nucleus-Nano system.